After a good chat about what life is like living in a hot tropical area Blossom and I decided not to go with the Minky backing or the traditional three layer quilting finish after all. 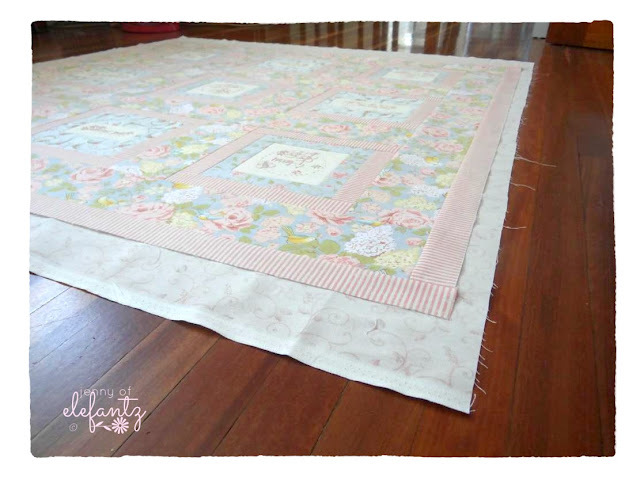 Many years ago I made her a summer quilt backed only with cotton fabric, and it's still one of her favourites because it's soft, perfect for our nine months of hot days and steamy humid nights, and light. We decided that's exactly what was needed for sweet little Cully May too. But back to the quilt. A simple cotton backing, not the pink spot I'd originally considered but a sweeter bird print that married with the birds in my stitcheries and the birds in the main fabric borders. I'll wash the quilt before I give it to Cully May. My hope is that she loves it, that she carries it everywhere and wraps it around her dollies in years to come. 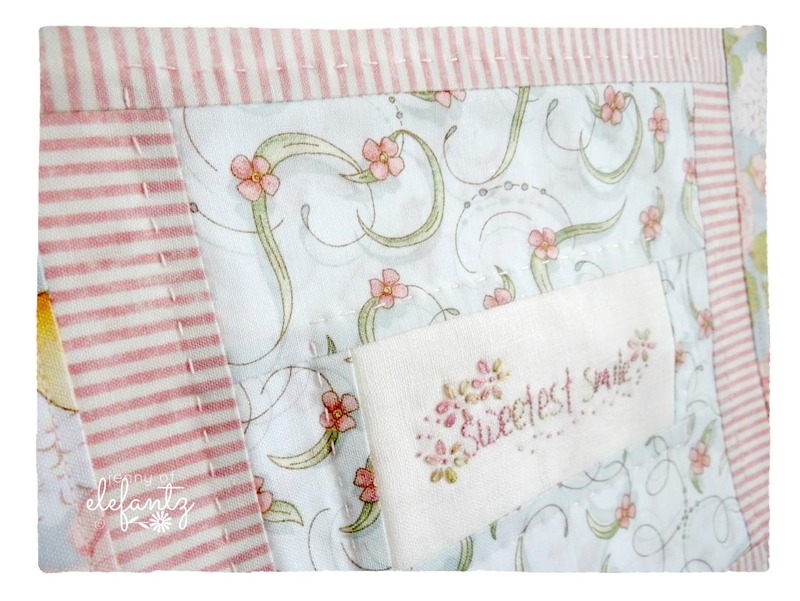 I believe quilts are to be used, to be loved, that they become part of your life. Sorry if that upsets some of you (a few emails begged me not to let her use it but to keep it untouched) but my children and their children all use their quilts, and that's exactly why I make them. If they stored them away I wouldn't bother. What would be the point? 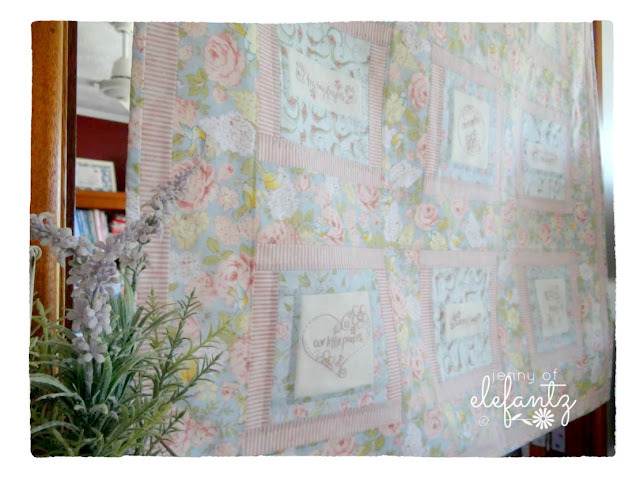 The free pattern to make this quilt is in my shop now. The embroideries are not included in this pattern but I have put links inside the pattern in case you'd like to purchase them. The pattern can also be made without the embroideries and I have addressed that in my sewing instructions. Enjoy sewing your own 'Cully May' quilt! Oh pooh...she should have it and drag it every place under the sun!!! As my Kids, Grandkids have with quilted, crocheted blankets and other things I have made for them! I loved used and abused, and loved until they are ragged! we can patch and repair them when needed! 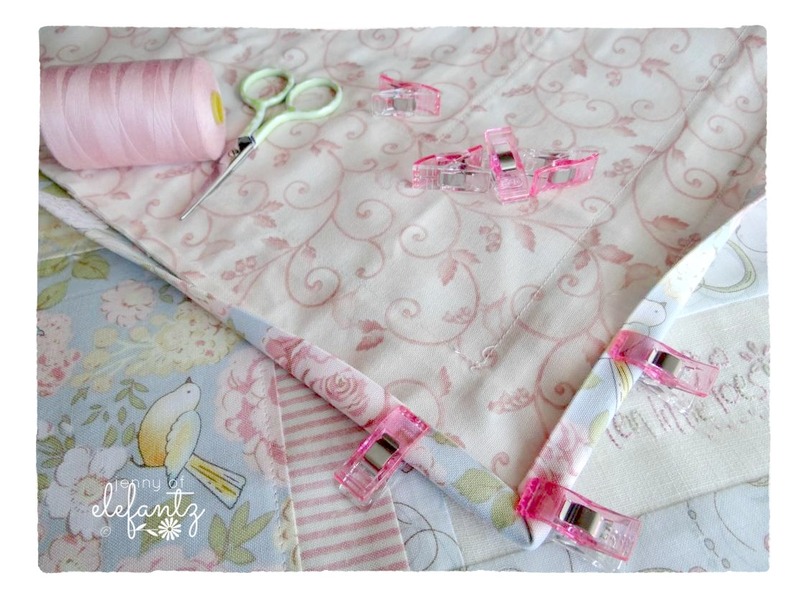 Thank you Jenny Dear for sharing your Cully May quilt tutorial. I also agree that used and loved is far better than pristine and saved/ignored. Decades ago I crocheted full size ripple afghans and matching pillows for all my in-laws family members...6 full sets. I was so unhappy to see that they stuffed them away in closets. I learned they were so snobby they only wanted and liked store purchased gifts. I'm agree with you: the quilts must be used . They are a loving hug from the quilter and it must be enjoy. With a little care and big love, The quilts will be beautifull for a long time. The signs of use are beautifull like life is lived. Absolutely adorable and quite beautiful, just like Cully May. I agree with you. Quilts are to use. If I don't want a quilt used I will make myself something to hang up on display. My quilts for my grandchild are going to be used. Thankyou for sharing the pattern with us. 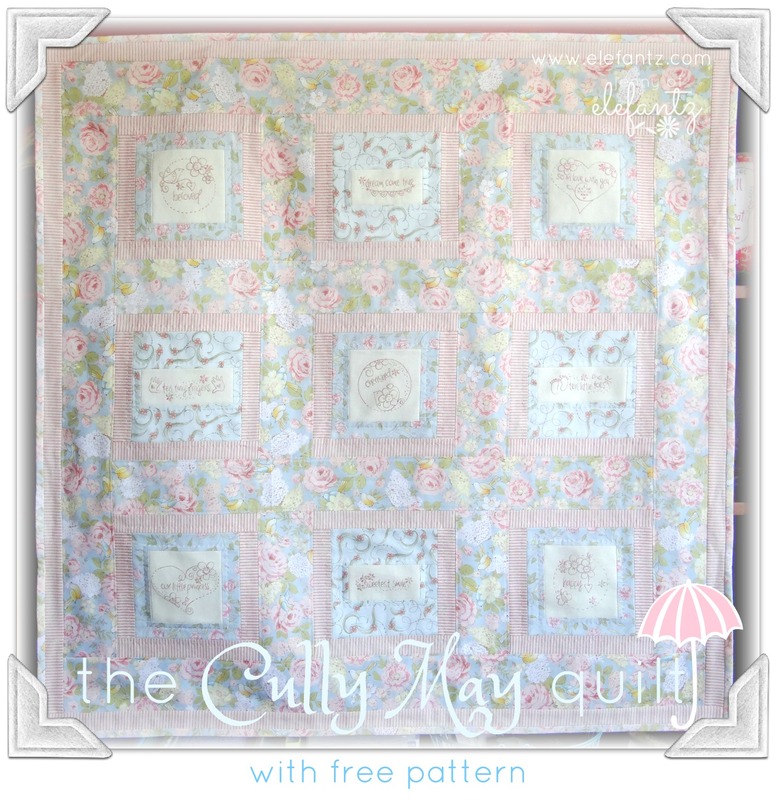 Cully May and her special quilt are both gorgeous, the quilt will be perfect as you finished it, very versitile and it is sure to be well admired along with Cully May and will be greatly loved and used for years to come. It is good to see well loved. Love the fabrics too, thank you for sharing. Judithann :-). Cully continues to get more and more beautiful! Love the quilt- what a great idea not to put batting in to make it so lovely and light! Judithann, the fabrics are from my stash...a couple are about 10 years old. What a lovely quilt, Jenny. It's a treasure to be loved and used. What a beautiful quilt! And a beautiful granddaughter too. I could watch Ava for hours too. And I agree...the quilts I make are made to be used. She's getting so big and just so adorable. Yes, some specialty quilts and such are meant to be decorative. But overall I'm in agreement they are meant to be used and loved on. As always, THANK YOU for the pattern. You have such a generous and giving heart. 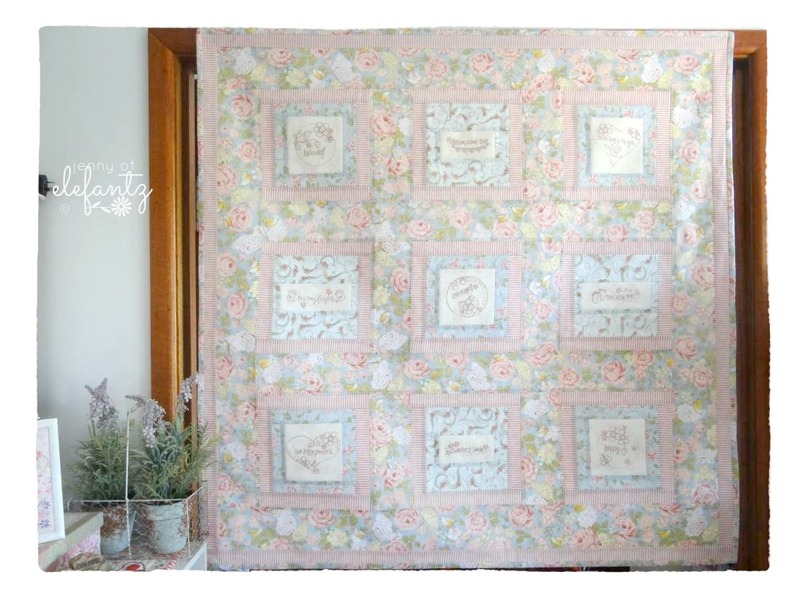 Such a sweet quilt and I agree with you, I want my quilts to I want my quilts to be used. Thank for the pattern. I want to buy the embroidery too. It is just perfect. Jenny, I had no problem getting quilt pattern downloaded but the embroidery pattern keeps failing. I have gotten the email showing paypal has paid for it and it is showing on my patterns to download. That is far as it goes. Any suggestions? I tried 5 different times. Hi Jenny, I love this quilt. Thanks for the lay-out for it. 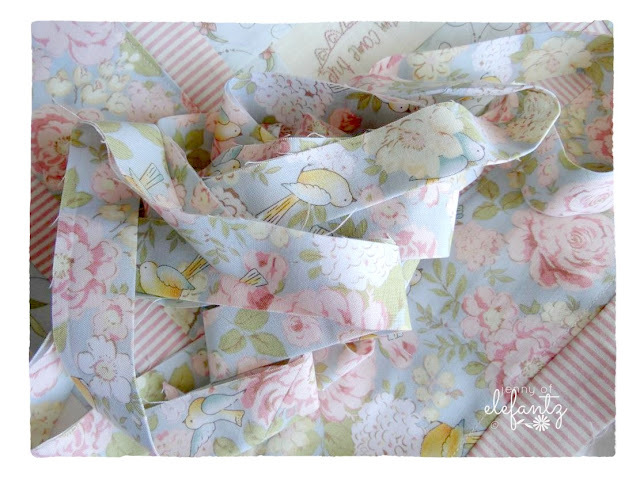 I love the soft colors of this fabric you chose. My girls had quilts like this made by family members for them. I like them for coolness and comfort. Your work is so pretty! A beautiful quilt for a beautiful little baby. And I agree, it should be used. I am currently making a quilt for my niece's baby-to-be in January. And I'm going to tell her it is a floor quilt for the baby to play on! 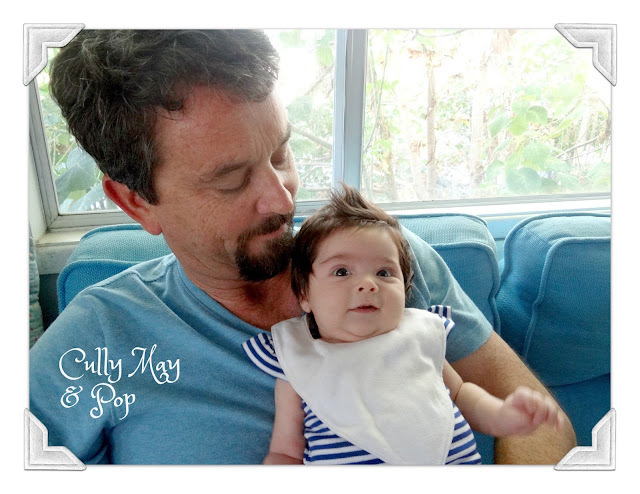 Your new granddaughter is adorable and so, so sweet, just precious!! She is so pretty and has a great head of hair! Thank you for sharing her with us. Thank you for the wonderful pattern. Your are so thoughtful! I'm with you. Use it, I'll make another one. 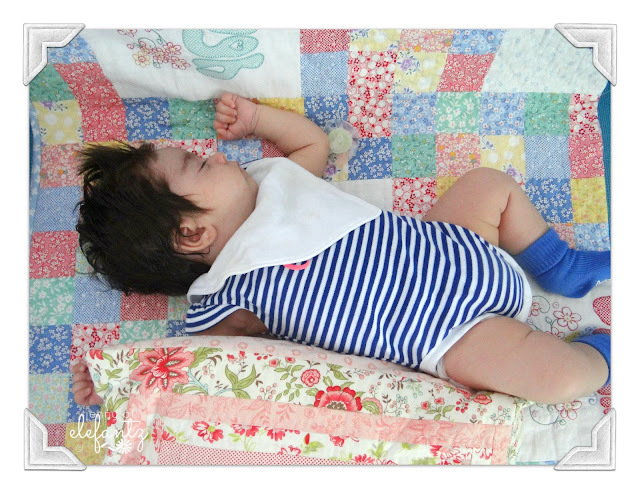 =) Beautiful quilt, beautiful baby. Lucky Blossom! That would be so cruel for her not to be able to use it. It's absolutely gorgeous! Like her she's a beauty isn't she. she is such a doll - a real blessing. Thank you for sharing the pattern. The quilt is stunning. I'm sure she will treasure it forever. Love, love, love this post from beginning to end. 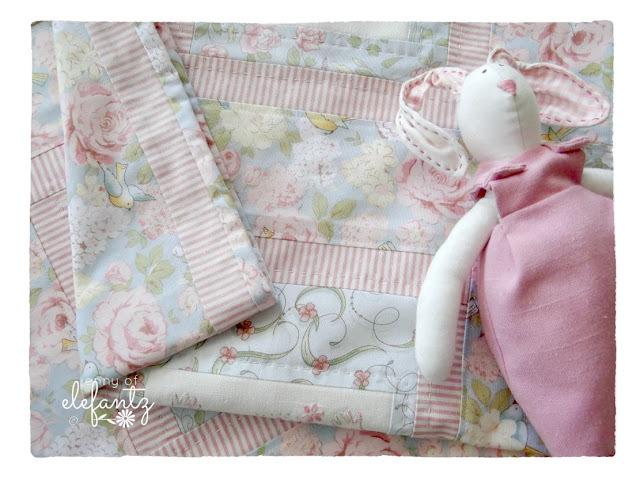 Beautiful baby girl, beautiful baby quilt! of cos quilts are to be used! 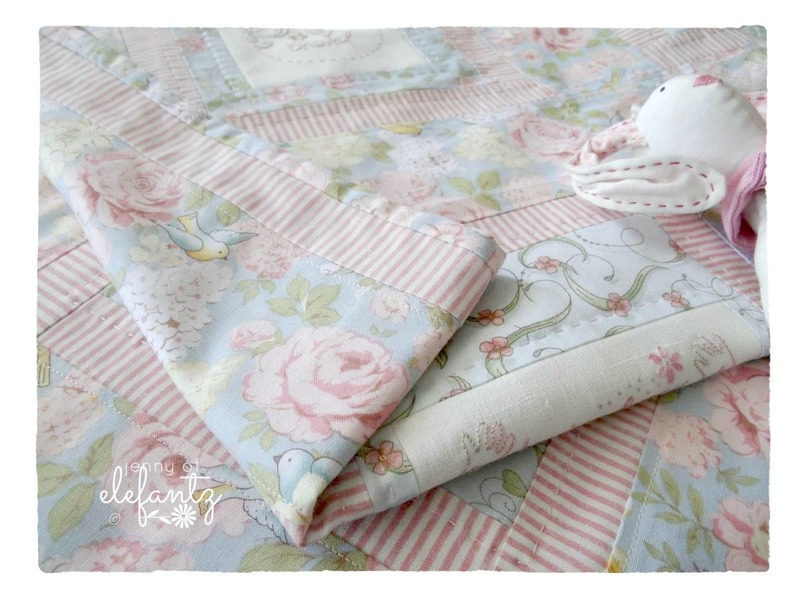 & what a beautiful quilt it is too for a very beautiful baby! 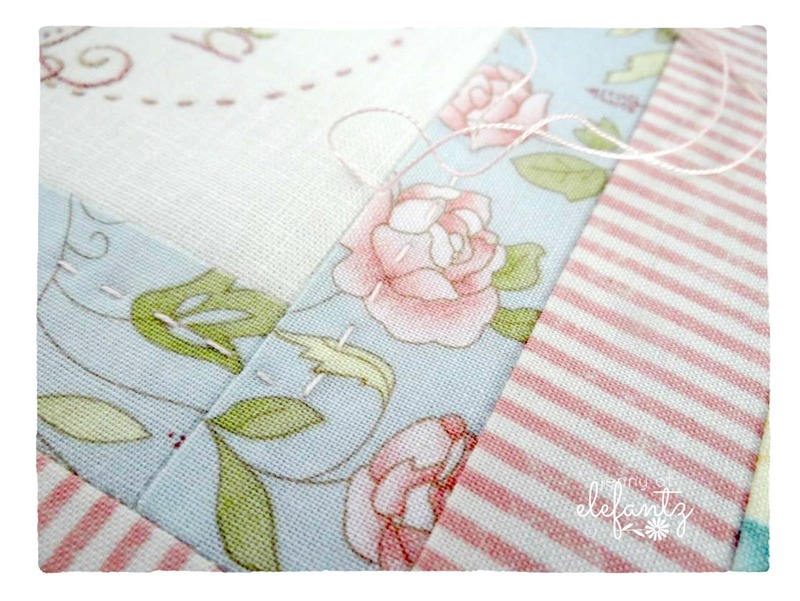 I agree that a quilt you made for someone, should be used, not packed away out of sight. Thanks for the pattern. I prefer to have something light over me when I sleep even when it is hot and muggy. I generally just use a top sheet. But when it drops 10 degrees, I switch to two top sheets--same idea, but yours is nicer! My mother in law made such great quilts. Each to fit the personality of who it was for. She insisted they immediately be put to use. Both my kids used theirs all the time and loved them. They soften with age and really appear loved. Thank you for the beautiful pattern. 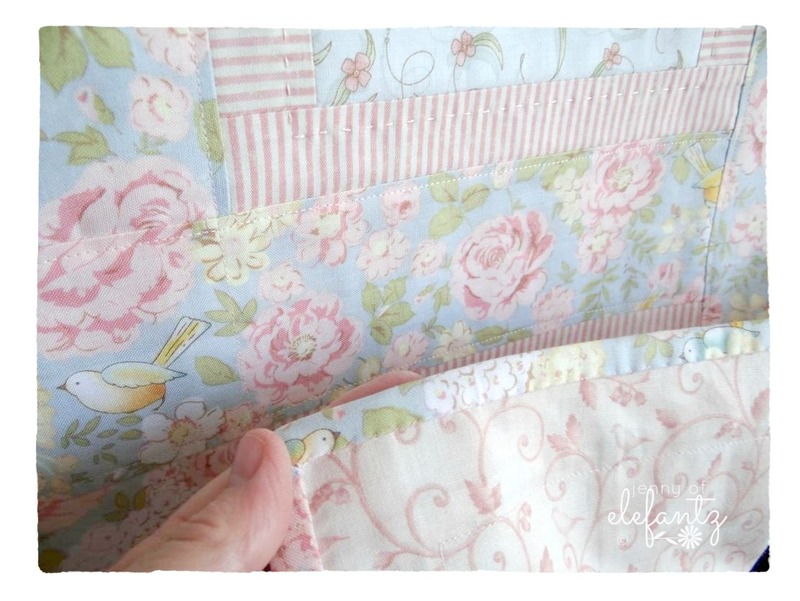 I was wondering what type of embroidery thread you used on this quilt. Is it a variegated thread, or do you switch colors often? Thank you! BJK, the stitcheries were sewn with a variegated thread. Just beautiful!!! Both quilt & babe :).